My good friend, Postal Worker Jane, just doorbell-ditched me. She does that, stopping her truck in front of my house to deliver my mail to my doorstep instead of making me hike all the way across the street to my mailbox. She started that practice when my boys were babies, and she’s still doing it now that those babies are off at kindergarten. Am I spoiled, or what? Minutes ago, Postal Worker Jane’s doorbell-ditching yielded a wholly unexpected package. Curious, I ripped open the yellow package—and then punched the air in triumph. 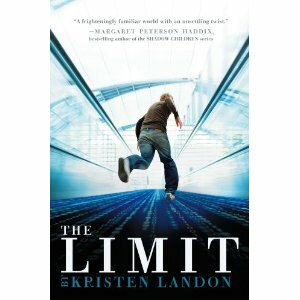 It was a copy of the new YA novel The Limit, by Kristen Landon. Isn’t the cover fantastic? I read The Limit back when it was a manuscript—a really great one, with a really enthusiastic agent, Steven Chudney. Kristen kindly credits me in The Limit’s acknowledgments for my guidance as she tweaked and polished, but the truth is that she just did an exceptional job with an unusual idea and she deserves every bit of praise that’s already coming her way for this book. I’m so very excited for Kristen. I’ll tell ya, Postal Worker Jane can doorbell-ditch me anytime! With this first sentence, readers are immediately thrust into a fast-paced thriller that doesn’t let up for a moment. In a world not too far removed from our own, kids are being taken away to special workhouses if their families exceed the debt limit imposed by the government. Thirteen-year-old Matt briefly wonders if he might be next, but quickly dismisses the thought. After all, his parents are financially responsible, unlike the parents of those other kids. As long as his parents remain within their limit, the government will be satisfied and leave them alone. But all it takes is one fatal visit to the store to push Matt’s family over their limit—and to change his reality forever. This sounds wonderful. I just preordered it on Amazon. How exciting, Deborah! Congratulations to Kristen. I’ll be on the look out for this one…it sounds like a great read!